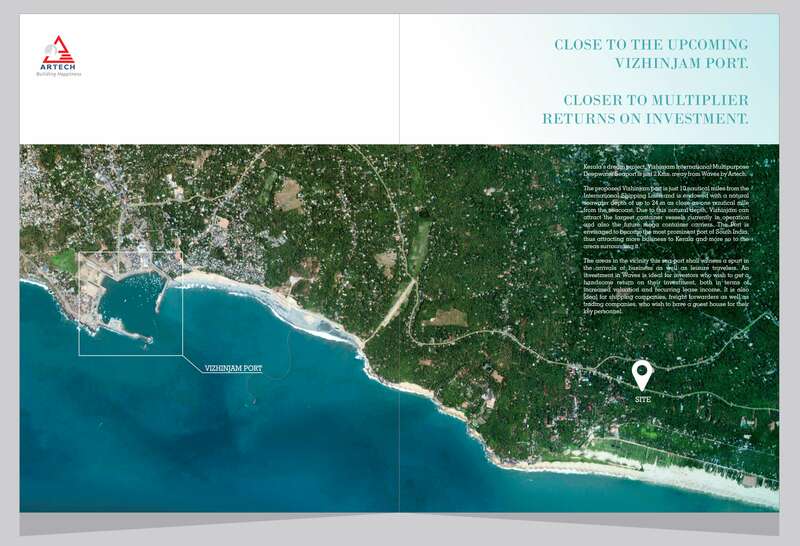 ARTECH WAVES is a new concept which redefines luxury living by the sea & is the first of its kind in South India. This project will have private residences along with full service International hotel to be operated by Marriott Hotels. This oceanfront property brings to you exquisitely designed residences together with rich array of indoor & outdoor amenities and an easy access to the beach. The presence of the elite 5-star Marriott Hotel in the same premises creates an atmosphere of true sophistication and an unprecedented level of personal service. Marriott Restaurants – 2 Nos. The charm of living next to the sea is a chance not many get. For those living in apartments in Vizhinjam Port area, life is inspiring on a daily basis. The Vizhinjam International Seaport is a deepwater multi-purpose shipping hub that’s located on the Arabian Sea coast at Trivandrum. The proper Trivandrum city area is a short scenic drive away and for those lucky enough to own apartments in Vizhinjam port area, life is bliss as this is a very peaceful area with clean, fresh unpolluted air. Interestingly, Vizhinjam is also steeped deeply in history as this region was the scene of many a battle between the Chera dynasty and the Chola dynasty. You can still find remnants of a fort built by the Ay dynasty as well as a unique rock-cut temple, both dating back to the 8th or 9th century. It is about 18km from the city center and about 3km from the internationally-famous Kovalam beach with its numerous resorts and ayurveda treatment centers. With this seaport expected to become partially functional by late next year, new businesses are expected to emerge in this region and Vizhinjam as a whole is expected to become a bustling region to reckon with. Costs of properties are expected to sky-rocket as this seaport town develops into a city in its own right. This is the right time to buy flats in Vizhinjam Port area, especially the luxurious ones being offered by premium builders like Artech Realtors.